Techniques for studying tribocorrosion with the Bruker UMT TriboLab tribometer, which combines tribological and electrochemical testing capabilities. Measure open circuit potential (OCP) during wear tests, for valuable insights into corrosion processes. This is useful when developing metallic materials resistant to degradation, in a range of industries including biomedical, chemicals, dental, marine, mining and petrochemistry. Blue Scientific is the official distributor for Bruker Tribometers in the Nordic region (Norway, Sweden, Denmark, Finland, Iceland). For more information or quotes, please get in touch. Unlike traditional electrochemical test equipment, the Bruker UMT TriboLab can measure changes in OCP (open circuit potential) during testing. This provides insights into degradation processes – useful when developing more reliable and durable metal materials to resist tribocorrosion. Tribocorrosion involves mechanical and electrochemical interaction between contacts. The process usually involves sliding wear, abrasion, cavitation damage, fretting and solid particle erosion. For example, a surface protected by a passive film can degrade due mechanical interaction breaking the barrier layer periodically. By combining tribology and electrochemistry, you can monitor OCP during electrochemical processes to study the electrochemical potential at which the cathodic and anodic reaction rates are balanced. Under such conditions, the net electrical current is zero. 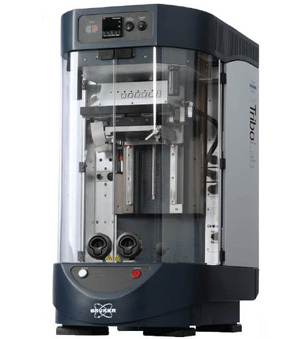 With the Bruker UMT TriboLab you can monitor OCP throughout tribocorrosion tests. Tribocorrosion studies require a tribometer and a potentiostat for electrochemical measurement. The tribometer provides controlled mechanical loading and relative motion between the metal and a counter-surface eg a ceramic ball. The tribometer measures friction force (Fx) and normal force (Fz). The value of coefficient of friction (COF) is calculated as a function of time from such force data. The potentiostat performs electrochemical polarisation tests and provides results in terms of corrosion potential (Ecorr), corrosion current (icorr) data, and finally materials removal rate due to corrosion. It can also record the OCP data along with data in force channels during the tribocorrosion test. Test bulk or coated metallic samples, and samples in chemical solutions (acidic, alkaline, oxidants, salt solution, body fluids, ionic lubricants, etc). Precise control of load, speed and position. Modular tribometer: test a wide variety of parameters. Hardware is detected and configured automatically. Compile test sequences easily with pre-built test blocks in the scripting interface. The plot below displays OCP (V0) as a function of time before, during and after a tribocorrosion test on AISI 316 stainless steel in a sodium chloride solution. Open circuit potential as a function of time before, during and after a tribocorrosion test on stainless steel in a sodium chloride solution. In the first 300 seconds no load was applied and the OCP value was about -0.220 volts. Then a load of 5 newtons was applied and a tribocorrosion test in sliding mode was performed for 900 seconds. During the test, you can see a gradual change in OCP towards the cathodic direction and an increase in friction force. The friction and OCP stabilise after about 400 seconds. At this point, the passive film protecting the steel was completely removed at the wear track, causing a dynamic equilibrium of friction and OCP. The maximum change of OCP from the start to the stabilization is about 0.080 volts. This change corresponds with the removal of the passive oxide film, which created a galvanic coupling between the passivated and unpassivated areas. When the sliding motion ceased and the load was released, OCP returns to almost the initial level. This type of stainless steel forms a passive chromium oxide film, which is self-healing and can protect against corrosion. In this test, mechanical wear damaged the film, but when the sliding stopped, it re-covered the tracks and the OCP gradually returns to a normal level. 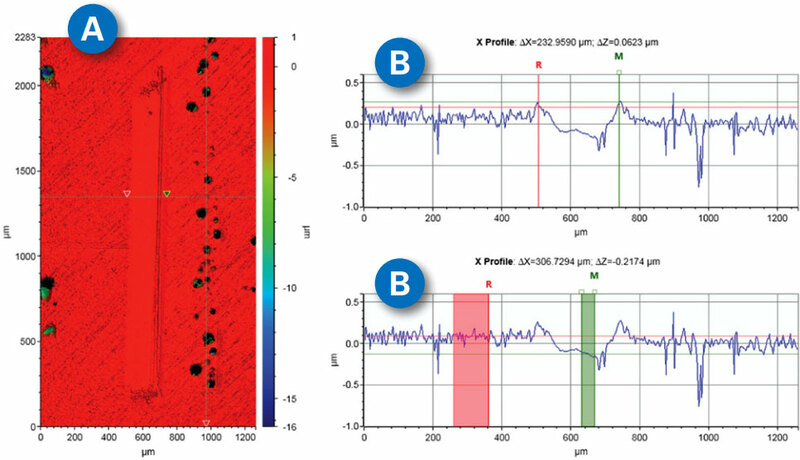 Click to enlarge: A) Wear scar profile on the stainless steel after the tribocorrosion test; B) Depth profiles of the wear scar along the horizontal line. Taken with the Contour GT 3D optical microscope. The tribocorrosion test was repeated in cathodic condition, where 1 volt cathodic potential with respect to OCP was applied to maintain a minimal electrochemical corrosion rate. At this level, the removal of material is caused mostly by sliding wear. Click to enlarge: A) Wear scar profile of the steel after the tribocorrosion test under cathodic conditions. B) Depth profile of the wear scar along the horizontal line. Taken with the Contour GT 3D optical microscope. Under cathodic condition, the depth of the wear scar is almost half of that observed under normal tribocorrosion test. This confirms that the degradation rate due to combined mechanical and chemical agents is low under cathodic conditions. This indicates that the rate of tribocorrosion is reduced under cathodic conditions. 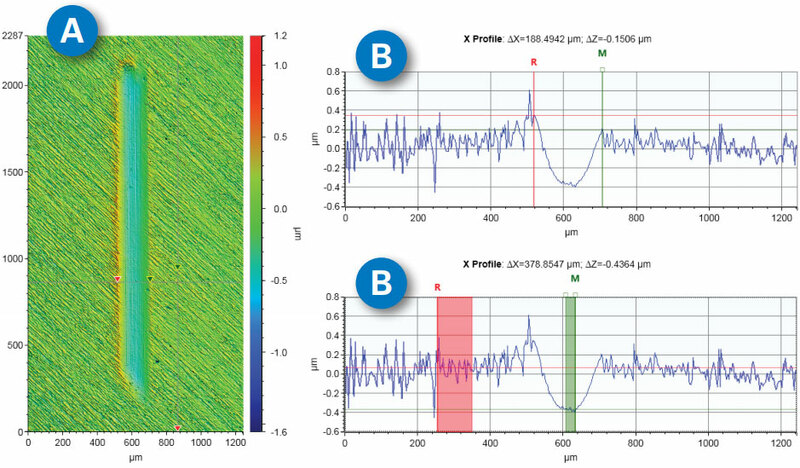 Comparing this type of data for different metals and in varying conditions can give you valuable insights when studying tribocorrosion, to develop metallic materials and coatings. The UMT TriboLab is ideal for performing such tests and many others, as well as monitoring the OCP.